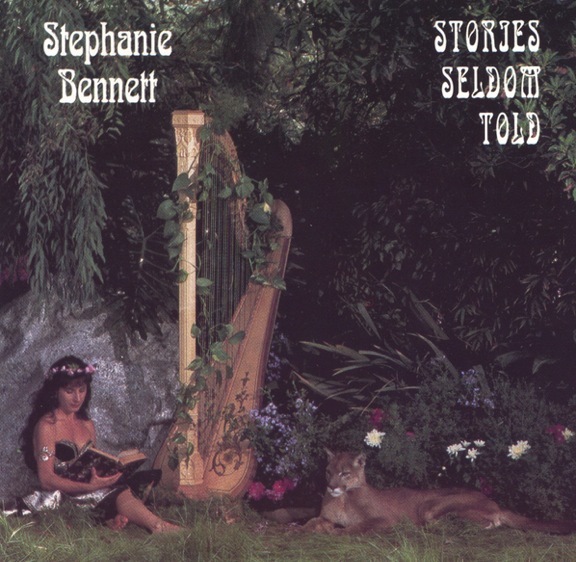 Featuring Stephanie Bennett on concert grand harp, with: winds, brass and strings; tablas, tympani and bells. Like fairy tales full of adventure and romance, music that inspires the imagination to dream. With a host of Los Angeles' finest musicians including Steve Kujala on flute and recorder, Doug Cameron on violin,and Frank Gambale on guitar. "This is a concert harp played with a difference! All the pieces are original compositions by the harpist. The concert harp and, in a few cases, the electro-harp are the main characters, and their supporting cast is composed of instruments such as the flute, cello, recorder, tablas, cor anglais [English horn], keyboard and guitar. Music in which it is possible to discover new nuances even after repeated hearing." - HARPA International Harp Journal. 1. MICHIGAN WINTER (6:12) Harp, flute and cello describe the peace of a snowy scene at dawn. 2. THE MAGIC FAWN (5:00) Reminiscent of a joyous Celtic dance, with a lively 9/8 rhythm. 3. ANOTHER STORY (3:59) With haunting English horn and alto flute. 4. THE RABBIT WHO BELONGED TO THE DESERT (4:17) In an energetic 5/4 rhythm, mystical and powerful, evokes images of the Renaissance with recorders, guitar and percussion. 5. A BIG CAT HUG (3:47) Harp solo, an affectionate lullabye, ends with the sound of a cat's purr. 6. DREAM DANCE (6:28) Hypnotic and dreamlike, with haunting bass flute, English horn, and strings. 7. DRAGONMAKER (8:44) A mini-concerto for harp, accompanied by a 14-piece orchestra of strings, winds, brass and percussion. 8. THE LULLABYE CHAIR (3:49) Inspired by the sound of a series of music boxes, each playing its short melody repeatedly. Ends the recording on a note of tranquility. These photos were shot in my back yard. I hired a live mountain lion (an experienced TV actress and model named "Cheyenne", from "Animal Actors of Hollywood" company) with her entourage of two professional animal trainers. The lion was on a leash attached to a stake in the ground to make sure she wouldn't go on an impromptu tour of the neighborhood. She was very gentle and beautiful! I designed and made my skirts and flower garland. I decorated an old book with synthetic gold and jewels to look like a book of magical fairy tales that I was reading to the lion. The photographer was Stéphan Shacher. The harp is my Paragon model concert grand pedal harp by Venus Harps.